After a day of work, Shawanda Jefferson picks up her four-year-old son at an unregulated child care center — her only option on her budget. Most kids enter the public school system at age five. But scientists say that, actually, it’s the first four years of a child’s life that are the most important for learning and brain development. High-quality early child care and education can set a child up for success in life. But can Louisiana families get access to it? And are child care facilities providing it? We investigate in a two-part series. Part One: How cost is a barrier for families seeking early childhood education. Listen to Part Two here, on whether New Orleans toddlers are getting quality instruction when they're families can afford to send them to licensed centers. WWNO's Jess Clark looks into how costs are preventing many families from accessing quality early education for their young children. 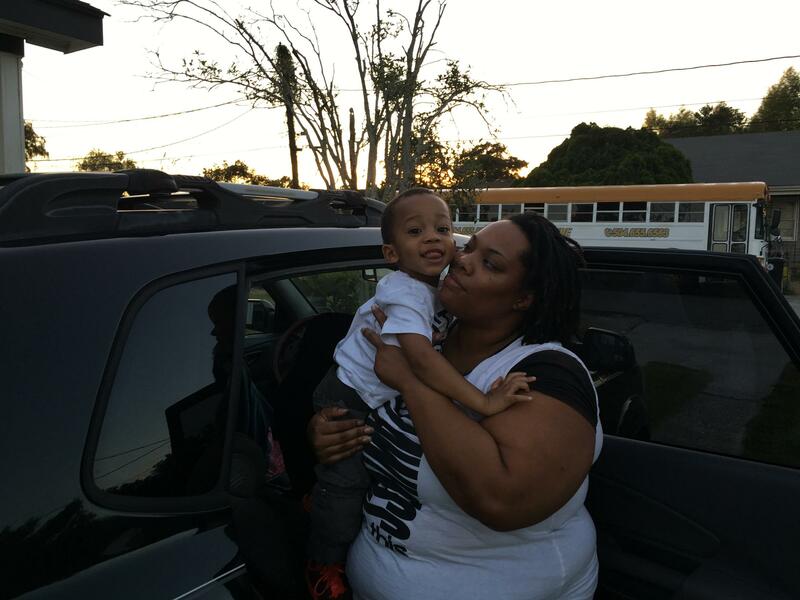 After a day of work, single mother Shawanda Jefferson makes a trip across her Algiers neighborhood to pick up four-year-old son Kwadir. He spends the day at a neighbor's house with about six other infants and toddlers. "Mommy!" Kwadir calls out as Jefferson enters her neighbor's modest, single-family home. The door opens to a living room where the furniture has been cleared away. Her neighbor sits in a small chair in front of a handful of toddlers. Overhead children's artwork — finger paintings in green — are drying on a line strung from wall to wall. This is an unregulated child care center. They're legal in Louisiana and a couple of other states if the owners are caring for a small number of children. But if Jefferson had it her way, this is not where Kwadir would spend his day. "He's safe, he's still learning…it's just not an ideal place you would want your child at. It's not the function of a school," Jefferson says. It is, however, all Jefferson can afford. A year ago, Jefferson and her two boys qualified for Child Care Assistance from the state, based on her low income. Both her boys were going to a licensed child care center from the time they were infants. When Jefferson reapplied this summer, she found out she was making too much to qualify for assistance: about $35,000-a-year. But she says it's still not enough to pay the full rate at her sons' child care center of about $600-a-month per kid. "Trying to keep up with that, and to keep up with paying with student loans and other things that I need — that was a lot of money coming out," she said. Child-welfare advocates say there are many parents who, like Jefferson, are being forced into difficult situations because of child care costs. The average Louisiana parent spends around $5,600 a year on childcare. "It's almost as much as a public college tuition," says Melanie Bronfin, who runs the Louisiana Policy Institute for Children. Bronfin says high-quality child care is closer to $14,000 — way out of reach for low-income families and even many middle-income families. Still, two-thirds of Louisiana children have working parents. Bronfin says that means parents are putting their kids any place they can, including unregulated child care centers, or with family and friends, where they may not be getting quality instruction. "So then it's no surprise that we have over 40 percent of our kids starting kindergarten behind in Louisiana," she says. Jefferson is frustrated that having worked hard to get off of public assistance, she’s still not making enough to afford quality early education. "You're not poor, but you’re not rich — you're stuck right in that middle class. And you're getting the bad end of the stick." Jefferson's youngest son qualifies for childcare under the federal Early Headstart program. But next year, he'll age out. Jefferson plans to send him to an unregulated childcare center with his older brother--the only option on her budget. Bronfin says plenty of low-income families are also getting the bad end of the stick. Since 2008, state lawmakers have slashed the number of publicly funded child care spots for low-income kids by 70 percent. State Superintendent of Education John White says next year he is going to ask state lawmakers to restore that funding. "We've got dramatic problems right now for the poor, and in our state we have a very, very large low income population," White says. "A huge percentage of our families are eligible for child care, and these are the families that are struggling to participate in today's economy...They're having a hard time doing it because of challenges at home. Let's help them out." Bronfin worries that until the state does start covering childcare costs for more families — low and middle income — a large portion of Louisiana students will be denied a strong start. Are New Orleans Toddlers Getting Quality Instruction?  In part one of WWNO's series on early child care and education in Louisiana, we heard about how costs are keeping many families from accessing quality early childhood education. 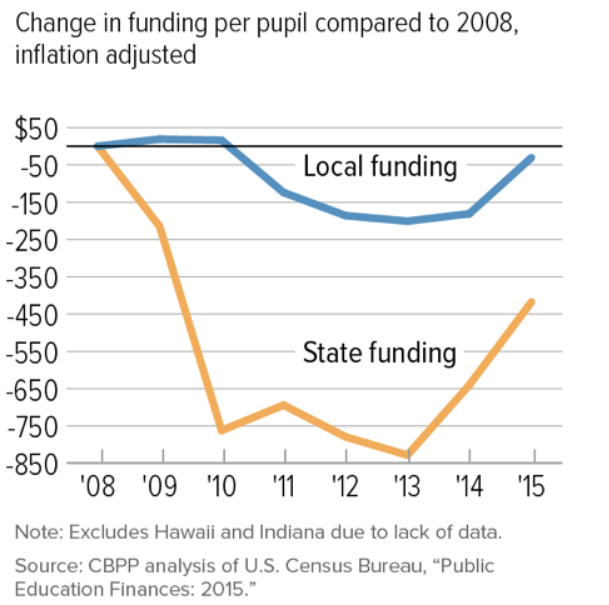 But costs are also having an impact on child care centers themselves. In part two, we look at whether children are getting quality instruction when families can afford to send them to licensed centers. Louisiana is among 29 states spending less on students than before the Great Recession, according to a new report from the Center on Budget and Policy Priorities.